As much as I complain about being a public school teacher, there are some wonderful perks, such as my 12 days of winter break. The first two days were very busy with last minute Christmas shopping, food shopping, house cleaning, getting ready for relatives and trying to give the little ones a semblance of calm in our chaotic days. We always celebrate with our family during Christmas morning. It starts at 7 and we gather for presents and breakfast. It may seem early, but the benefit is that it is over by 10:30 leaving us the rest of the day to lounge in our pajamas, enjoy our new gadgets, and otherwise veg about. Usually the days running together with no set schedule and nowhere to be cause me a great deal of anxiety. When my days are less busy, my mind tends to wander and worry, reexamine and remember and these things are never a good combination. What I found this year is that instead of he foreboding and anxiety I was greeted by an eerie feeling. I felt calm and at peace almost as if so many of the weights I have been carrying around with me were lifted off and simply floated away. I know that not having to go to work definitely made me happier, but it was more than this and I really wish I could do a better job of explaining it. I feel as if the impending-ness of 2015 made me shed my 2014 skin. Ill feelings I had were erased. Worries that constantly plagued me, while still there, seemed less overwhelming and important. For the first time in a long time, or maybe even in forever, I felt like everything was going to be ok; like everything is exactly as it should be. I feel like I’ve truly let go of all of the baggage that has accumulated in the past few years. I feel like these moments, regrets, fears, mistakes, will no longer rule my life and be a constant influence on the future decisions I make. 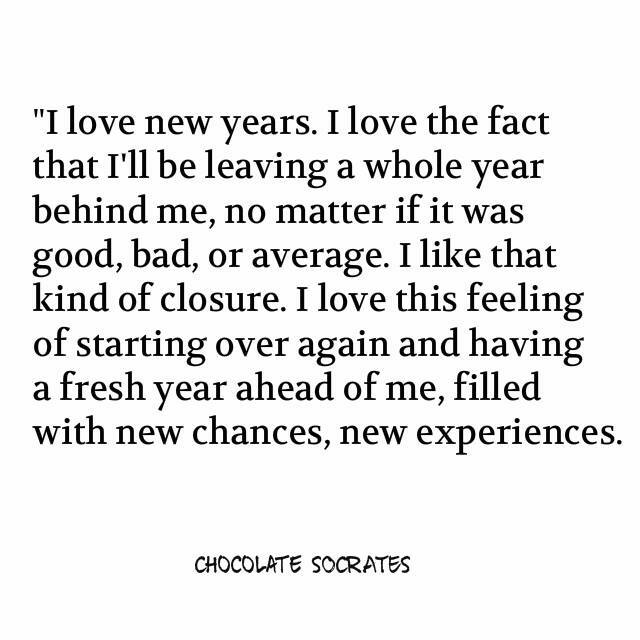 I’ve mentioned before how much I love New Years (https://hereswhatimtryingtosay.wordpress.com/2013/12/27/the-time-has-come-the-walrus-said-to-talk-of-many-things/) It’s this wonderfully magical time when you can just start over. I’m not naive enough to think that the world actually resets itself or that you can’t simply start over any other day of the year, but something happens when you get close to a new year. You can feel the difference, the change in the air, the realization that hope is on its way. I am no longer the person I was when 2014 began, and I really couldn’t be happier with the changes that have occurred, but I think there’s more. I’d like to keep this feeling of peace and calm. I’d like to do better. I’d like to be better. The changes I’ve made to myself are indisputable, but with baby #3 on the way, there is no doubt that I can still grow, I can still change, I can still become a better person, a person that all my children can be proud of. A person that I can be proud of.